We’ve all heard about glide, but what is it really and how does it affect our system? Glide, or temperature glide, is the difference between the bubble point and the dew point of the zeotropic refrigerant mixture. Well that wasn’t very helpful, was it? All we did was introduce new terms without defining them and further confused the issue. So, let’s start with zeotrope or zeotropic mixture. A zeotropic mixture is a chemical mixture that never has the same vapor phase and liquid phase composition at the vapor-liquid equilibrium state. Still unhelpful? I thought so, too, so let’s look at what it means to us rather than what the books say. A zeotrope, is a refrigerant mixture or blend that boils across a range of temperatures at any given pressure. So, unlike water that boils at a constant temperature of 212°F at atmospheric pressure, a zeotropic mixture will boil between across a range of temperatures at that same single pressure. Using r407a as an example, at atmospheric pressure, the liquid would begin to boil at -49°F and will continue to boil until the last droplet boils away at -37.5°F. I know that it’s kind of weird to think of the process of boiling like that, but that’s what is happening with a zeotrope. Boiling takes place over a range of temperatures. That temperature range is called the glide. Now that we’ve got a basic concept that we can work from, we can start to understand glide and ultimately get to how it affects a refrigeration system. Let’s start with bubble point. Since we should have a solid understanding of states of matter and the transition between liquid and vapor, let’s assume we have r407a refrigerant in a 100% liquid state at 140 psig. If we start at 66°F, we’ll be just slightly subcooled which is a perfect starting point for this example.. If we start to add heat and raise the temperature of our refrigerant while holding our pressure constant, a single bubble will appear in the refrigerant as it begins to boil. That point is called the bubble point. For our purposes, we can define the bubble point of a zeotropic refrigerant blend is the point at which the first bubble appears. Still making sense? I hope so. Continuing with our r407a at 140 psig example, we’re going to continue to add heat to the refrigerant with the same constant pressure. 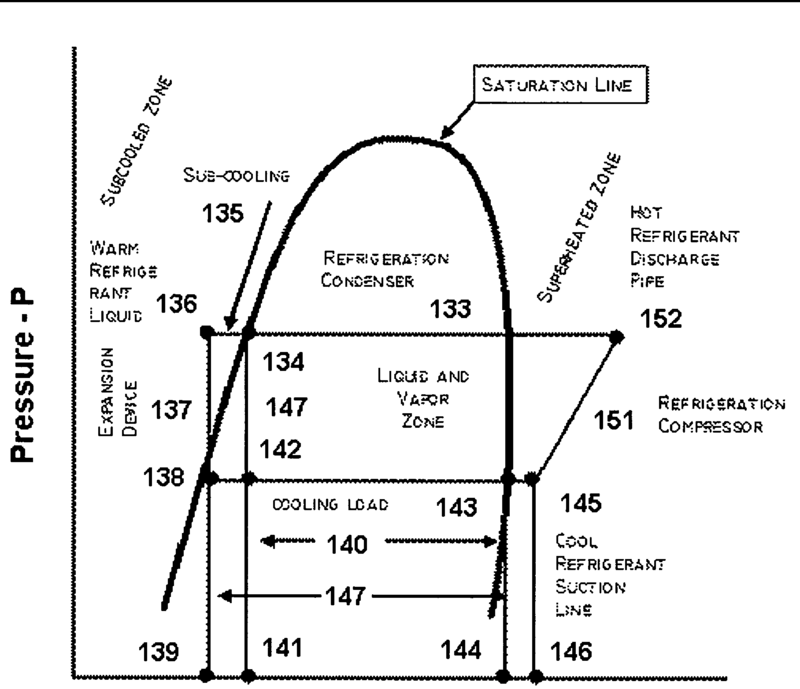 The refrigerant continues to boil, but as the mixture of refrigerant changes, the boiling point changes, slowly rising as the liquid boils away. Eventually, we will have added enough heat to reach a point where one last droplet exists, that point is called the dew point. Like we did with bubble point, let’s state an operating definition for bubble point. The dew point is the point at which the last droplet of liquid evaporates. For our example, that temperature is 75.5°F or very near that. Since it’s boiling over a range of temperatures, it is also true that the refrigerant condenses over the same range of temperatures as we remove heat from it. That will happen in reverse of the process I just described. What does this mean for the service guy? Obviously, these different values affect our superheat and subcooling readings. Since the dew point is the point where the last droplet of liquid boils off, we need to know that value to measure and calculate superheat. Similarly, with the bubble point, we need that to calculate subcooling. These are the values found on the PT charts and that are programmed into your digital manifold gauges. In refrigeration work, evaporator coil temperature can be used for a number of things. Most commonly, we will use it to control fixture temperature and to terminate defrost. It used to be simple to know what our evaporator temperature is. We looked at the gauge and transferred that number to a PT chart. We can no longer look at our evaporator pressure and know what our corresponding evaporator temperature is quite the same way. Let’s look at numbers… say the manufacturer says that you need an 18°F coil temperature. With R22, you simply look at your trusty PT chart, find 40.9# and work from there. Easy enough, right? Now, let’s look at the same coil with r407a. We have 2 points that are 18°F. The dew point (40#) and the bubble point (52.5#), so which one do we choose? The correct answer winds up being neither one. Between manufacturer’s recommendations and field experience, I’ve found it best to use something closer to the average of dew and bubble point to find the actual, functional temperature of the evaporator. Looking at a PT chart, this shows us 13°bubble point and just over a 23° dew point. If you look, 18° will land right about in the middle. This isn’t always a perfect setting, but it’s as good a place to start as you can find. Set the control valve there and fine-tune it as needed to get the performance that you need. If we need to use a pressure reading to terminate defrost, we will need to reference bubble point because it is the colder of the two temperatures and will ensure a complete defrost. If we used dew point, the inlet of the evaporator would be several degrees colder than the outlet and frost may still very present. I just want to point out a possible error. Near the beginning of the tech tip, it’s stated that glide is the difference between the bubble and dew point of an azeotropic blend. An azeotropic refrigerant by its definition has no glide as well as no bubble or dew point. This has always been my belief. I may be wrong. Feel free to delete this comment after editing the tech tip if you agree.